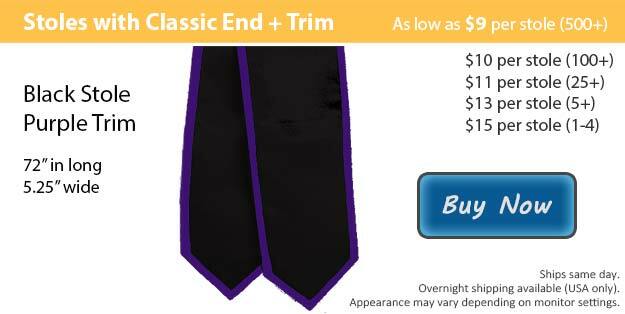 Our black graduation stole with purple trim is a spectacular choice, the vibrant purple counters the sleek black wonderfully for a stole that student would be proud to wear. Allow Honors Graduation to be the first to congratulate you as you begin preparing for your big day! Graduation is not something that comes easy, you have focused years of your life, sacrificing it all to successfully make it this far. This is a key moment in your life and at Honors Graduation we are here to help things go off without a hitch. We have all of your wardrobe wants and needs to have you looking astonishing in time for your graduation. From customized graduation accessories to your cap and gown combo deal, we have everything to ensure that you are absolutely ready for your big day. As you join your friends and family in celebration you are not only closing this chapter of your life but also setting out on a whole new adventure. Your graduation is a day that you'll never forget so it is crucial that you look your best. Our graduation stoles are the perfect way to accent the rest of your graduation outfit. We offer custom embroidery for a small additional fee if you wish to add an image and wording to your stole, you can even choose the thread color. Custom stoles are an excellent way to represent your group or club during your ceremony and also make for the perfect keepsake afterwards. Our stoles come in a couple different styles, we have the classic option as well as an angled finish. We have a large selection of colors to choose from and each of our stole options are available without the contrasting trim as well if you prefer to have a solid stole.